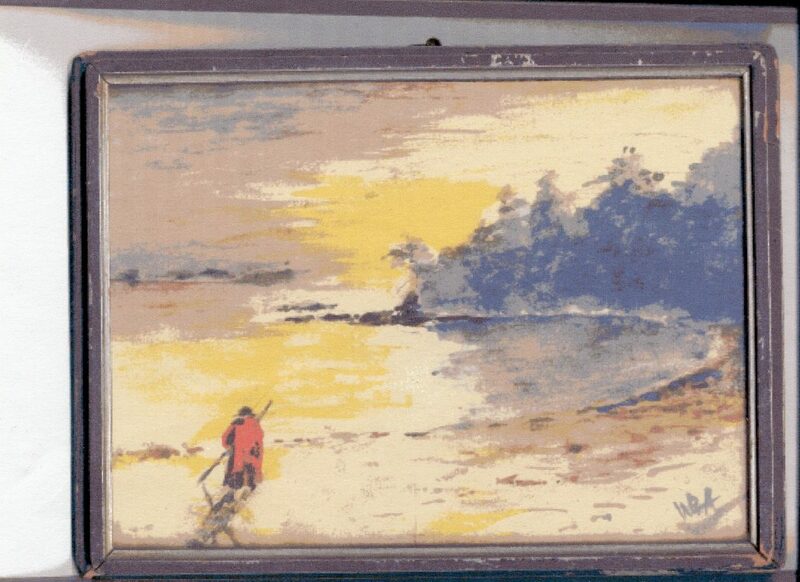 This lovely little painting was done by Alexander Caulfield Anderson’s son, Walter Birnie Anderson, who was a member of the B.C. Police in the Comox area. He did a number of paintings such as this, and many of them are still around. All that we have found have a First Nations person in them. He must have given this painting to his youngest brother, my grandfather, and so it came down through the family to me. So in Anderson’s Indian Reserve Commission Journals, we’ve reached the Musqueam Reserve and recorded what happened through Friday, November 10 1876. In many of these posts I am not going to offer an explanation, because that will take a great deal of researching that I did not have to do to write my book, The Pathfinder. But if you have anything to offer, please do so in the comments. I will, however, delete any comments that are not respectful to the First Nations people whose reserves were being assessed; to the Indian Reserve Commissioners who were obeying the instructions given to them by the British Columbia government; to the settlers who purchased the land from the B. C. government legally or illegally; or to me. A courteous and respectful conversation between First Nations, historians, and descendants of settlers is what I hope for — we can all learn from that sort of conversation. In fact I would love to know what happened to some of these reserves. I am sure the “cranberry swamp” no longer exists. “Fri. 10th — The heavy rain of yesterday ceased about midnight, the wind shifted round suddenly to the N.W., and blowing with great violence continued through the day. Our little “Leonora” dared not face the Gulf of Georgia — compelled therefore, to stop. Spoke to the Indians, assigning them formally their old Reserve and the recent addition, and giving them such advice as seemed appropriate. “Afternoon, having given directions to our “Captain,” Mr. Wilcox, to get up steam, we ran up to the residence of Mr. Ferris, the resident I.P. [J.P.? ], taking with us several of the head men, with the view of explaining to Mr. Ferris in their presence the result of our doings here. Mr. Ferris kindly offering to accompany to the Encampment, returned thither with that gentleman’s boat in tow. Here the requisite explanations and recommendations took place, and general satisfaction was expressed. By this time evening had come on; and [as] we did not wish Mr. Ferris to incur the risks of a night journey on the [Fraser?] river, with a strong gale blowing, we prevailed on that gentleman to remain with us, making him as comfortable as our means permitted. “The following is a resume of our settlement of the Musqueeam [sic] Reserve. Finding that the lot on which is the old Indian house site (Lot 28) visited by us on the 7th has been disposed of by Crown Grant, and is now in possession of the man, Boyd (who by the way has never made his appearance), we assign to the Indians in lieu thereof a better piece of land, more convenient to the main (old) reserve, and the only section of good land now available in the vicinity — viz: fractional Lots 8 & 9 on Sea Island, immediately opposite to, and about a mile distant South from the border of the old Reserve. “As regards the rail round a small enclosure on the old village site (which however appears to have been made after the issue of the crown Grant to Boyd), and which rails are claimed by Simila-neuch, we arranged with Mr. Ferris, I.P., that he should see Mr. Boyd and recommend him in an amicable way to settle the matter with Simila-neuch, either by allowing him to remove the rails or by paying him for them. In the event of any backwardness on the part of Boyd to assent to this arrangement Mr. Ferris will consult with Mr. Superintendant [James] Lenihan as to further proceedings. The Chief Simila-neuch is quite content with this arrangement, which now rests with the parties named. “As regards the original Reserve the Commissioners confirm it to these Indians as on the official Map, namely, as including 342 acres, and from the high water line down to low water mark, so as to include the privilege of dyking [sic] to reclaim the land. “The Commissioners secure to the Indians the right of way through a portion of land (so far apparently unoccupied) lying at the back (or Northern boundary) of the old Reserve and contiguous, Westward, to Sec. 320 [I think this is what he says], to the public road leading to New Westminster; and thence again to a certain Cranberry Swamp northward of the road, in which they have a prescriptive right of gathering fruit for use or sale. “The Commissioners assign to them, as before mentioned, Lots 8 & 9 (eight and nine) as on the Official Map on Sea Island, from its respective inland boundary down to low water mark, so as to include the privilege of dyking so as to reclaim tidal land, as in the case before described. “Generally with regard to the Reserve as now arranged I may remark that it appears to include a sufficient acreage to meet all the requirements of the Indians; and with the increase of meadow-land now assigned to be in every respect satisfactory to them. In the future the extent now available (exceeding 400 acres) may be very greatly increased by dyking. From 700 to 1,000 acres of very rich alluvial land might thus be redeemed on the frontage of the two portions of the reserve, at a comparatively moderate expenditure of labour. “We have [left] this place with the satisfaction of knowing that, so far as outward manifestation may indicate, the Indians are delighted with the result of our proceedings; and assuming our success here as an augury for the future we are encouraged to hope that elsewhere the like good fortune may attend our efforts. It is interesting to see Mr. James Lenihan appearing in this section of the journal: he was one of the federally appointed Indian Superintendents in British Columbia, along with Israel Wood Powell. When the Indian Reserve Commissioners were in the interior, Lenihan appeared there. The general effect I was left with is that he was insane, and certainly not a person who should have been a member of this commission. Edward Mohun was appointed surveyor to the Indian Reserve Commission in 1876, and surveyed reserve allotments through Vancouver Island and the coastal mainland. He had arrived in Victoria in 1862, and had a very interesting and varied career over his lifetime.